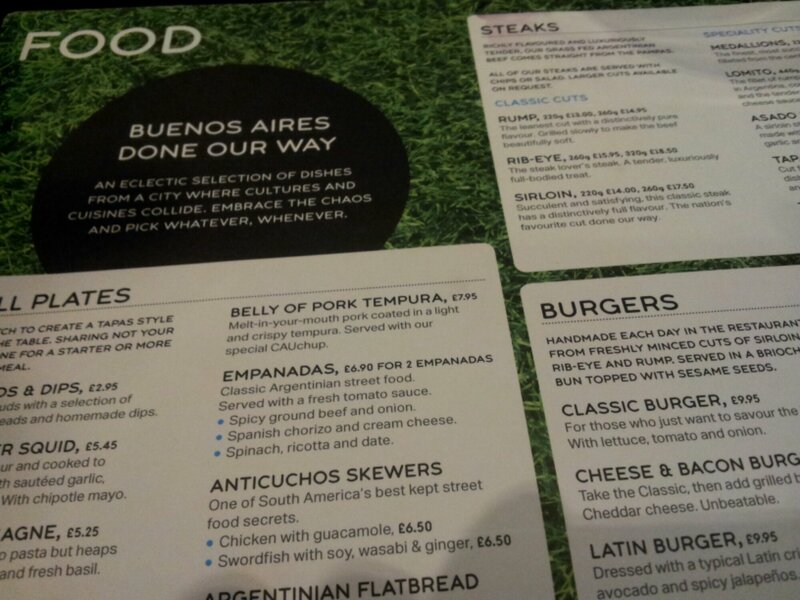 Sampling Argentinian Cuisine at Cau, Blackheath – Why Waste Annual Leave? If you ever spotted a flying Pumpkin floating between continents circa 2006, then that would be my husband. Cambodia and Namibia are just 2 of the places I would love to see but understandably, it is difficult to persuade him to revisit these when there are so many places he still dreams of seeing. Between us, we have 4 large (mine are annoyingly large for a lady as little as me), wanderlusting feet, none of which have touched South American soil and this year, we hope for that to change. The exact wheres and whens remain to be seen but Argentina seems to be trending in our minds as the destination of choice and only time will tell whether finances, work schedules and organisational skills permit. In the meantime, we are living our Argentinean dreams vicariously through Cau, a new restaurant on the vibrantly saturated Blackheath dining scene – a Buenos Aires culinary experience with only 3 branches in the country, one of which is near my marital home and the other near my childhood parental home – is this some kind of sign? The issue, however, is this. The name is by no means cryptic. Cau is wordplay on cow and given that neither of us eat beef, we were concerned about whether we would have any place being in an establishment like this or indeed whether we would even be allowed through the doors. Reassuringly, a quick sweep of the website starts to tickle the tastebuds and we spot many items we can eat in amongst the cow options for the rest of you! 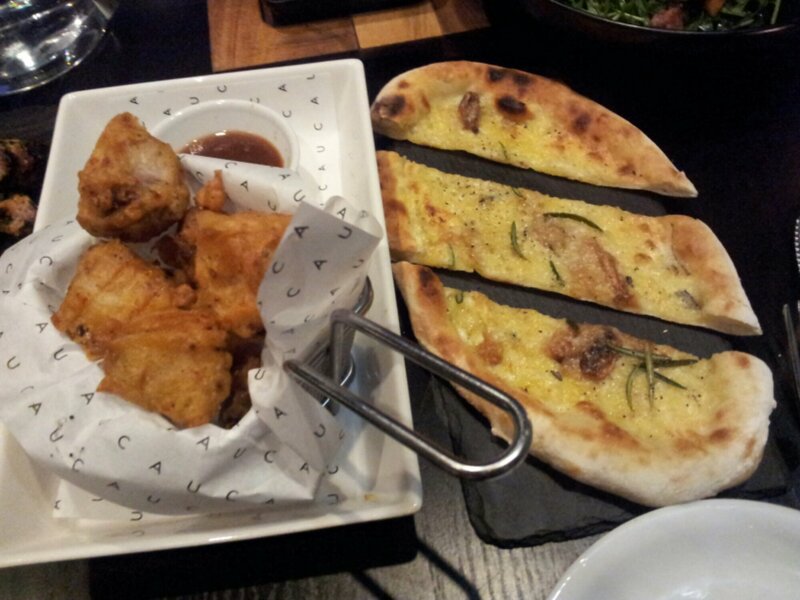 We also spot a small-plate tapas –style option. This proves ideal – it is only the 1st week of January and we are entering the post-Christmas “healthy” eating phase of the new year. We arrive at a bustling restaurant, just light and loud enough to rope in young crowds and friendly and welcoming enough to keep a loyal fan base. Blackheath seems to have a rapid turnover of restaurants and mastering the secret to staying grounded in this environment is definitely the Da Vinci Code of the village. The first item that screams out to me is the pork belly tempura – I’ve had said belly many times in restaurants but I’ve never had such a, crispy tender and melt in the mouth bite, ideally complemented by he tangy sauce served with it. 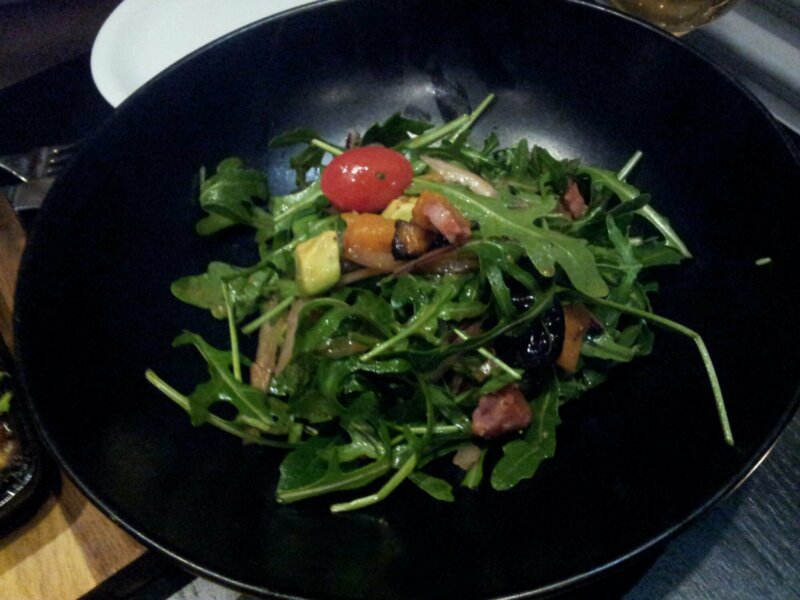 As per the health plan, we throw in a salad for good measure – sweet potato, avocado and chorizo, an intriguing combination of flavours. 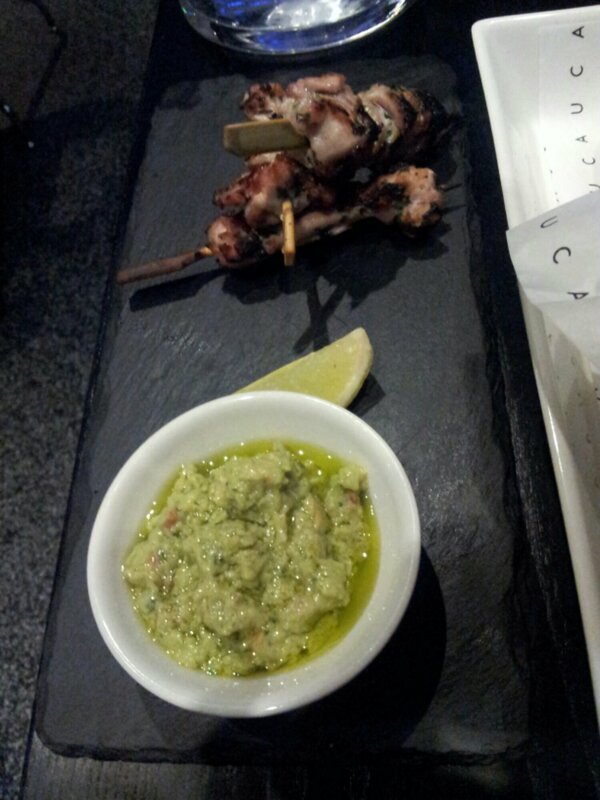 The chicken skewers were nice enough but it is definitely the guacamole it comes with that stole the show here, creamy with a zing – I could eat spoonfuls of this stuff alone. Flatbreads come in a variety of flavours and we opt for rosemary, garlic and parmesan – it was perfectly crispy and full of cheesy goodness – it always amazes me how much flavour can be earned with just a few sprigs of rosemary. 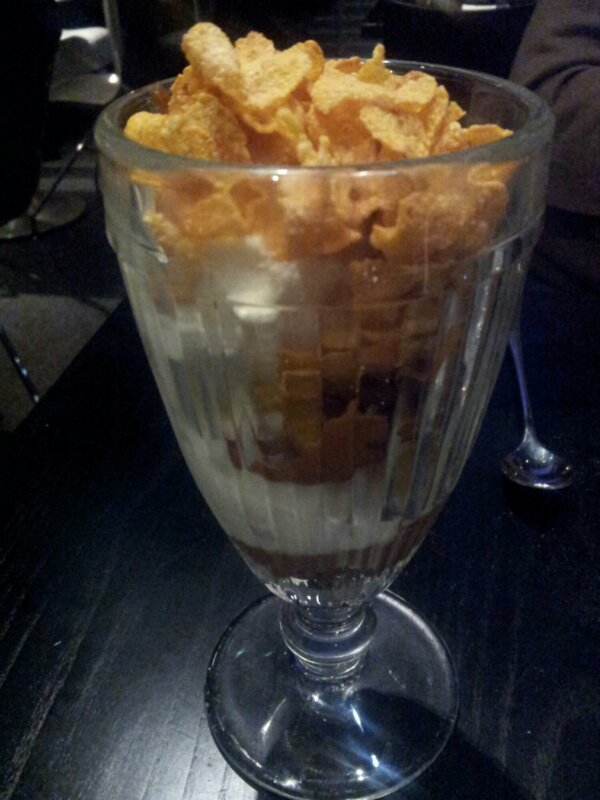 We were saving space for dessert as I had heard a lot about the famous cornflake icecream sundae. With layers of chocolate brownie, cornflake ice cream, dulche de leche and topped with cornflakes – what’s not to like? As Pumpkin put it, it felt “like eating cereal with ice cream”, then asking me “Can I eat my cereal with icecream every day?” Could Pumpkin retrain as a food critic? It was delicious with the warm sweetness of the dulche de leche contrasting beautifully with the earthy chocolate brownie, the cold cornflake icecream and the crisp cornflake topping, all coming together in a saccharine explosion in my mouth… although I don’t know that I would have identified the ice cream as cornflake flavoured in a blind taste test. 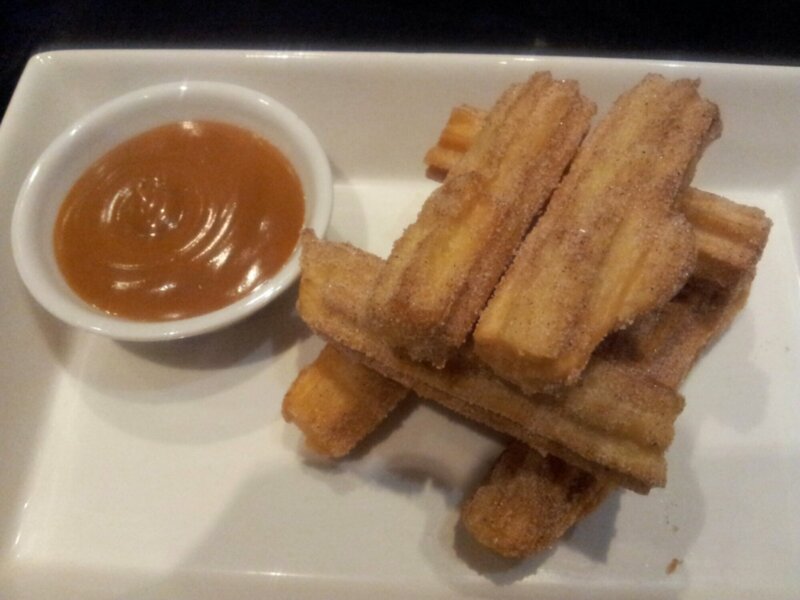 Our helpful and perky waitress also recommends the Churros dipped in dulche de leche. We are no strangers to Churros – the Greenwich Market ones being my all time London favourite but here at Cau, these certainly give them a good run for their money, slightly crisp on the outside and perfectly soft inside. This is a serious calorie fest, despite all our January resolutions but has only corroborated our longing to see the country that inspired it. Will I be back? Yes most definitely and next time, I think this would be a fun night out with friends. The one that got away? On my next visit, I’ll be ordering the spinach and ricotta empanadas, the grilled chicken tortilla salad and the dulche de leche pancakes for dessert. 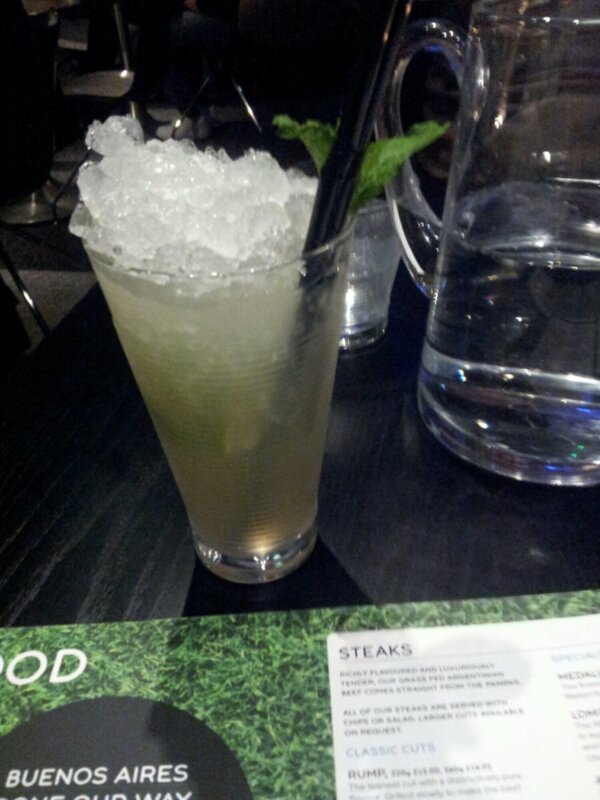 This is a welcome addition to our local dining scene and has to rank up there in my top 5 local restaurants. If you’re in the area, check it out. Actually, even if you’re not, do it. Pingback: A Matcha Green Tea London Food Tour | Why Waste Annual Leave?